The Fall 2018 edition of ForumMag is here! Discover it now! 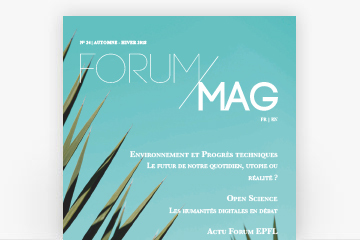 The Forum Magazine is published by Forum EPFL’s team. It is a free semestrial publication, about 40 pages long, adressed to all EPFL students, i.e. more than 10.000 readers. More specifically, it targets future graduates and PhD students. The Forum Magazine deals mainly with graduates’ professionnal integration. It informs students about services offered within the school (Forum, seminars, etc.) Furthemore, it offers numerous advices in a view of helping graduates in job hunting. For this 2018 Edition, the Spring Magazine will be published in April, and the Fall edition in September. In total, 3000 copies will be printed out and distributed on the campus. Forum EPFL offers you the opportunity to publish your advertisement in its Forum Magazine. For the Spring edition, you can contact us from February to March (*). For the Fall edition, you can contact us from May to July (*). We would be delighted to present you with our different possibilities and to send you our advertisement release. (*) These dates are subject to slight changes from one year to the other.